Climate Change and Beef — Just Atonement Inc.
As we work to conserve natural resources, optimize land use, and control the emissions that led to climate change, most of us feel more-or-less helpless more-or-less all of the time. And we feel most helpless when we see our tiny actions and decisions (like carpooling and recycling) looking comparatively minuscule beside the actions of corporations and policy makers. But there are a few things that we do literally every single day, over and over again, and even the smallest changes worked into these personal routines can make a measurable difference, especially when our actions influence the behavior of others around us. One of these actions, for example: thinking about the food on our plates. We all eat several times a day, and just a few thoughts about what we’re eating and where it came from can have a meaningful impact when compounded over time. The steak on the table had to be raised using how many gallons of water? How much grain? Where was that grain cultivated? What pesticides were used to grow it? Where and how were the pesticides manufactured? According to a recent report from Vox, simply thinking about these things can open our eyes to potential avenues of action that can limit our carbon footprints and decrease our impact on the planet. While most people aren’t ready to commit to fully vegan diets (six percent as of 2017), a growing number of Americans are cutting back on red meat and dropping as little as one serving per day or per week, to everyone’s benefit. Earlier this week, the New York Times posted an article discussing some policies that could be put in place to reduce consumption of the most ecologically detrimental foods on our table-- Specifically, a carbon tax placed on beef, one of the most destructive items available in any given grocery store aisle. The Cattleman’s Beef Association (much like similar industry groups including the tobacco lobby) works to limit any restrictions placed on profits to ranchers and beef producers, from dietary recommendations that promote alternative choices, to research that reveals links between beef and heart disease. Like any industry association, they apply their influence and financial resources to encourage the flow of beef from ranch to table, thereby supporting ranchers, beef processors and all who make a living on cows. 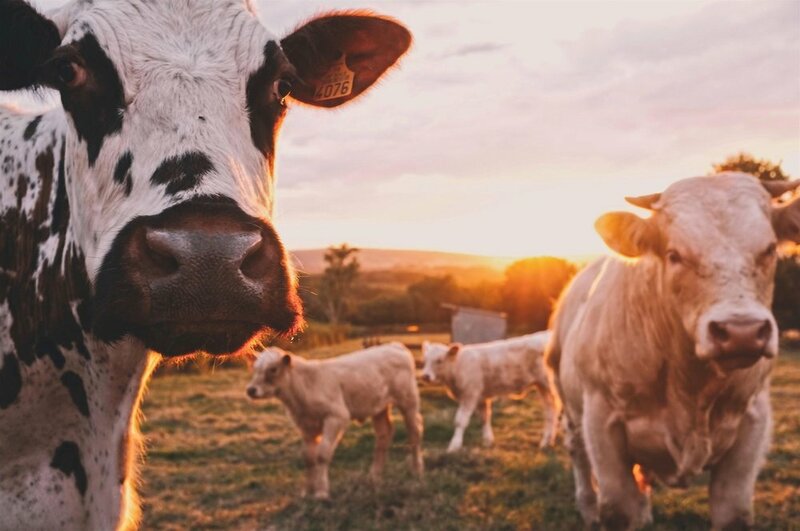 But agriculture represents the third largest source of greenhouse gas emissions on the planet (after energy and industry) and 14.5 percent of all global emissions can be linked to livestock. These emissions come from multiple aspects of cattle raising, slaughter, processing, and transport, including the fossil fuels used to grow their feed, the methane emissions from their stomachs, and the way their manure is processed. Unlike a tax on fossil fuels, which can impact our ability to commute to work, a carbon tax on beef wouldn’t unfairly or uncomfortably restrict any aspect of our American lifestyles, and it could have a huge positive impact on our own futures and those of generations to come.